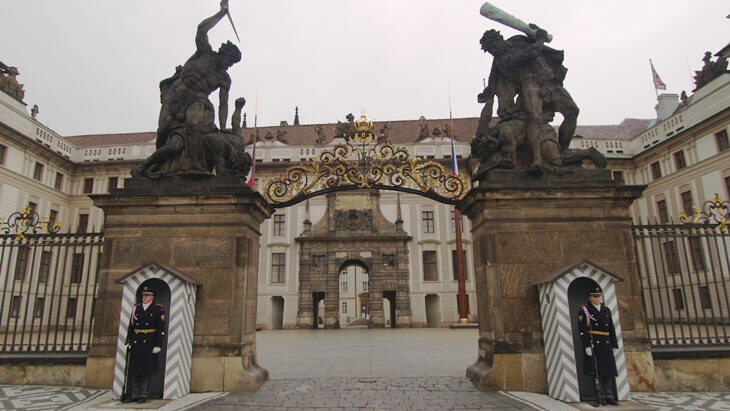 The first Baroque structure 1614 at Prague Castle, the Matthias Gate is named after Matthias, Holy Roman Emperor. The inscription in the gable lists his titles, and the gate also features the coats of arms of lands he ruled. Giovanni Maria Filipi was probably the architect, and in the eighteenth century the court architect Nicolo Pacassi incorporated the Matthias Gate into the entrance complex. The Matthias Gate forms part of the group of buildings around the First Courtyard of Prague Castle and contains a number of important spaces, including the Pacassi Staircase and the State Rooms. The Pacassi staircase, leading to the southern wing, is the work of Ignaz Platzer the Elder. Highlights of the State Rooms include the Throne Room, where diplomatic representatives and delegations are received by the President of the Czech Republic, and the lofty Rothmayer Hall. Among the other notable rooms are the Brožík Drawing Room, featuring paintings by Václav Brožík; the Mirror Drawing Room, the Reception Room, and the Music Room. Each year, the State Rooms are open to the public for a few days in May.